Product Details-FEATURES-Fun scratching, board for your cat,Works on cats basic instinct to scratch, Can be placed any where, Easy to maintain, SPECIFICATIONS -Length - 19 inch, Width - 5 inch, Material - Cardboard, Suitable for - All cats. Product Information-The Trixie Scratching cardboard lying for cat can be placed anywhere in the house for your cat to play with. This is a basic cardboard scratching board for cats of all ages. This is a very important tool if you have cats in your house. This plays on the inherent need of your cat to scratch, getting home this handy toy can save your upholstery and furniture.This basic colour board is portable and can be taken anywhere, so this can be a perfect for the vacations. The lying scratching board is fun for all cats and it can even be dusted with catnip, which attracts your pet towards the board. 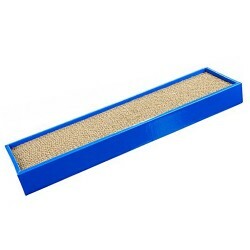 This Trixie scratching board can be placed anywhere in the house though you should always make sure that it is placed in an area, which is easily accessible by your cat and he or she can see it. There is no age limit to use this scratching board and can be used by cats of all age.